Humayun’s Tomb: It is located in the Nizamuddin East area of Delhi, the first garden tomb in India and resting place of the Mughal emperor Humayun. It was constructed by Humayun’s chief consort embress Bega Begum in the year 1569-70 made by using red sandstone. It is also registered in UNESCO world heritage site. Red Fort: Red fort is located in the centre of the national capital New Delhi, was the main residence of Mughal Emperors. It was built by Shah Jahan in the year 1939 and made by red sandstone. It is the place where the Prime minister unfurls the national flag on the occasion of Independence day, every year. Qutub Minar: Qutub Minar, 73m tall brick minaret, is the tallest tower in the world and the second tallest monuments of Delhi. It featured in UNESCO World heritage site and constructed by Qutub Ud-Din-Aibak. It is the five-storey building and a mosque is built at the foot of the tower is the first mosque in India. Lotus Temple: It is a remarkable landmark of Delhi, and also known as Bahai’s House of worship is a wonderful architecture. Here you can sit in peace and pray to their respective Gods. It is the temple which is also considered to the Bahai faith which proclaims that all proclaim and religions are united. India Gate: It is located in the Rajpath in the capital city of India. It is dedicated to all that 82,000 Indian and British soldiers who sacrifice their lives during the First World War. It is unveiled in the year 1931 by the Indian Viceroy Lord Irwin. It is a wonderful historical structure of 42 meters tall was designed by Sir Edwin Lutyens and one of the Largest war memorial in India. 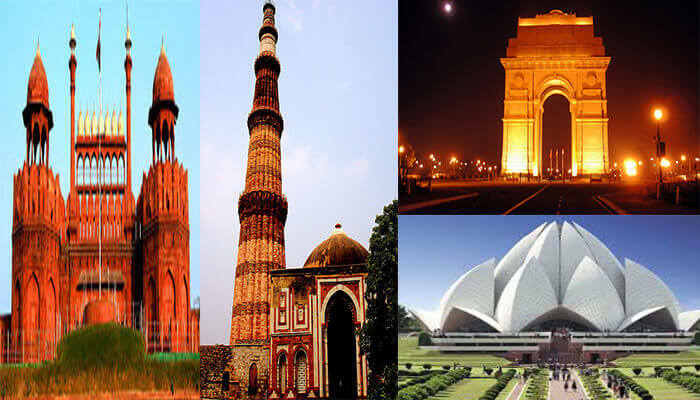 Real India Journey caters you an excellent opportunity to explore Golden Triangle Tour Packages, Rajasthan Tour Packages and Same Day Tour Packages with Private Car drivers and Car Rental Services with best tourist guides.